Chances are you’ve seen these cookies. I am, in fact, a full two years behind the buzz. See, when Kim Boyce came out with her Good to the Grain cookbook in 2010 the blogosphere went nuts for these whole wheat chocolate chip cookies. Orangette was sold. Marisa of Food in Jars raved about them. Sweet Amandine called them home. And me? I kept making my old Martha Stewart standbys like a sucker. Typically baked goods that call for whole wheat flour still use half all purpose flour to keep the texture in check. But these little daredevils use 100% whole wheat flour. Would that really be good? Wouldn’t they be dense little pucks? I should have had more faith, both in Kim Boyce and in my fellow bloggers who lost their minds over these cookies. Because of course they’re that good. They’re firm and chewy, rich in flavor, sweet but not too sweet. They’re perfect. And they call for 2 cups and sugar and 2 sticks of butter so there’s no way you can call them health food. But maybe, just maybe, you can feel a little bit better about yourself because they’re packed with wholesome whole wheat flour. Don't be intimidated by the whole wheat flour in this recipe. These chocolate chip cookies stand up to any you've ever had. Preheat the oven to 350F and line a large baking tray with parchment. Put the flour, baking powder, baking soda, and salt in a bowl and whisk together. Set aside. Put the butter and sugars in another large bowl and mix until fully creamed and combined (a stand mixer makes easy work of this). Add the eggs one at a time, beating until each one is incorporated. Mix in the vanilla. Add the flour mixture and mix until just fully incorporated (use your hands if necessary). Bake for 16 to 20 minutes, or until light golden brown. I know! They’re great – I hope you enjoy them as much as I did! I welcome any excuse to eat more cookies! They do sound great. I wonder if cookies go well with buckwheat flour. Thanks Lizzy! Great question – let me know if you give it a try. I haven’t baked with buckwheat flour. I’m sure they are yummy, I will try these cookies for my son Katherine! Have a nice week! I’m sure your son will love them, and you can rest a little easier knowing they are whole wheat 🙂 Hope you have a great week too! Yup, I’ve been in the skeptical camp about these too. But you’ve sold me – I’ll definitely have to give these a try. (Or suggest them to my wife – she’s by far the better baker.) 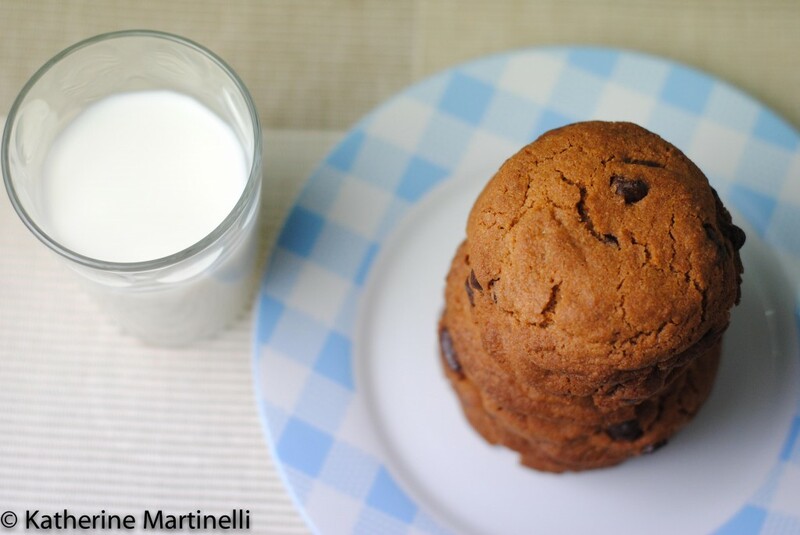 And who can resist a picture of cookies and milk? Love the overhead shot. Thanks. I know, I held out for as long as I could! But I’ve never had so many recipe requests for cookies as when I shared these. I hope you and your wife enjoy them! And glad you like the overhead shot, thanks! There is nothing like a good chocolate chip cookie. I can’t wait to try this version. Delicious! I keep thinking of whole wheat chocolate chip cookies and want to make some version of them….these sure do look amazing! Love these cookies! The whole wheat works so well with the chocolate. I like trying different flours and Kim Boyce’s book is a great resource. I just made her crumble bars using rye flour and they were terrific (and included lots of butter!). It really does! I don’t experiment nearly enough with different types of flours, I’d like to start. I’ll have to check out her crumble bars, thanks for the recommendation! Well, you’ve sold me, I’m now going to have to try these cookies!!!! Mmm. I love cookies like this. I am definitely going to have to try this. Me too! The whole wheat actually adds great flavor. I hope you enjoy them! I know my children would not say no to a batch of those yummy cookies! And I would not mind sneaking a little fiber in their tummies, too! It’s a win-win! I’m sure your kids will love these – I hope they do! oh yes, wholewheat and chocolate! I would love them too. I have actually never had a cookie made with whole wheat flour, but it sure looks like it works deliciously. I will need to try to make better use of that flour and cookies are a great way to start! Inspiring post. As I mentioned I’ve used whole wheat flour in cookies and baking before, but never entirely whole wheat! But these just work. Thanks so much Tina! I can’t wait to hear how your ventures with whole wheat flour come. I’ve felt the same way…but now, with your endorsement, I will have to try these out on my family! They look amazing! Did you see Saveur’s list of the top 10 viral recipes? I think this was on it. I haven’t tried it, since I’m 100% in love with the NYT chocolate chip cookies (another recipe on that list). I wonder how they’d turn out with whole wheat flour ….. Yes, I think I did! I will have to try out the NYT recipe next time. And with whole wheat flour? Now you’re talking! I would have to switch them to white. No wheat allowed for Miss Bee. These look decadent like crazy. Great cookies Katherine. Huh! Well I’m sure these would be great with regular flour as well – hard to go wrong with chocolate chip cookies! Hmmm maybe the “whole wheat” part makes balances out those extra butter and sugar part? =) I’ve been seeing so many delicious cookie posts lately and I wonder how I’m going “not” to make these delicious cookies! Impossible! It seems like this is one of special recipes that we all should keep! I couldn’t agree with you more Betty! I hope you give these a try soon, I know you’ll love them as much as I did! I made this recipe last night and they are AMAZING! I used imitation vanilla extract and sea salt substitutions because I did not have pure vanilla extract or kosher salt on hand. The cookies were soft and buttery. I will definitely be making these again andy I’m going to be back to your blog. So happy! Yay! Isn’t it a great recipe? It’s hard to believe it’s all whole wheat.